Ten years after Hurricane Katrina devastated the city of New Orleans and the surrounding areas, the story of the survival of Patience and 18 other African Penguins from the Audubon Aquarium of the Americas is cause to celebrate! In August 2005 when Katrina hit, the Aquarium was severely damaged. With no electricity or relief in sight, the temperature in the Aquarium rose dangerously putting the penguins in peril. The penguins and other animals were forced to leave their home and their favorite human, taking an unexpected journey to the Monterey Bay Aquarium in California. After nine long months the Audubon Aquarium was restored and Patience and her traveling companions were able to return to their home! 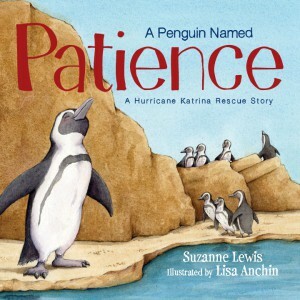 To learn more about the author’s experience writing A Penguin Named Patience, click here. I was an artist before I was a writer. I earned my BFA in Studio Art and went into commercial art as a graphic designer and advertising art director for many years creating TV and print commercials. Later, I went into photography, traveling the world on assignment which I loved. But, I’ve always enjoyed books and started working in a bookstore and that’s when I really started writing seriously. Although as a kid I spent more time drawing than writing. 2. Why did you choose the story about Patience and the Audubon Aquarium? I’ve always adored penguins so when a friend suggested I go see the penguin exhibit at the Audubon Aquarium, I learned of their ordeal during the hurricane. I thought that would make a fun picture book. 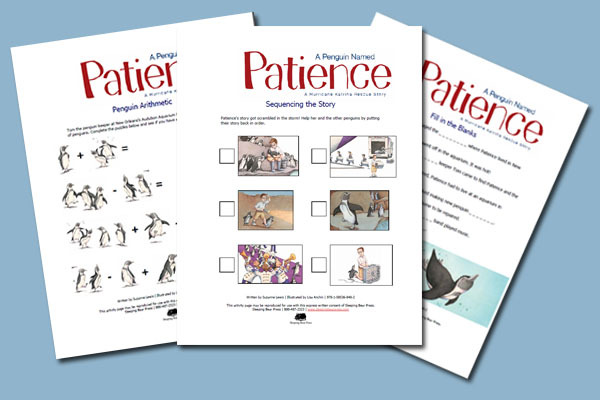 Actually, my cousin, who is a children’s librarian said, “that would make a great picture book!” So, I asked a lot of questions of Tom the penguin keeper and developed Patience’s story. 3. What was the hardest part of writing the story? The hardest thing about writing the story was that I kept wanting to give the penguins human qualities. For instance, in my mind’s eye I saw them getting on the plane with their little backpacks and I even had Patience sitting next to Tom. However, my agent kept dissuading me from “anthropomorphizing” the penguins since this was a non-fiction book. It was also difficult to tell the story in as few words as possible. We had to leave out parts to stay true to the picture book format like how there was a kind policeman who stayed at the aquarium and fed the penguins until the staff could get back to work. 4. Tell us about the research process. I researched the story by visiting the aquarium and reading as much as I could about Hurricane Katrina on the internet. I watched some videos that FedEx had put together on their contribution to the rescue as well. I asked Tom, the Aquarium’s penguin keeper, lots of questions since he was the human who spent the most time with her. A Penguin Named Patience – Fun for Kids!